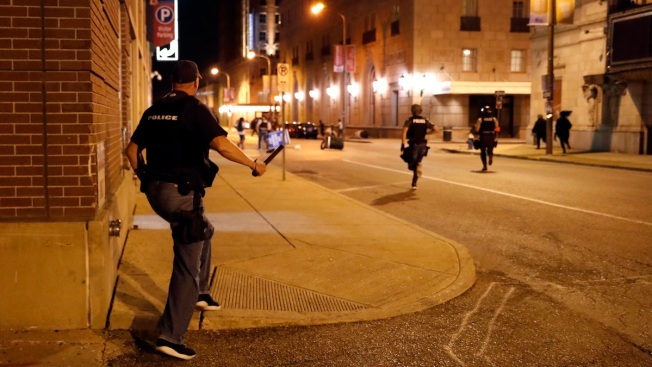 In this Sept. 17, 2017 file photo, police chase vandals as demonstrators march in response to a not guilty verdict in the trial of former St. Louis police officer Jason Stockley in St. Louis. Stockley was acquitted in the 2011 killing of a black man following a high-speed chase. Four St. Louis police officers were indicted Thursday, Nov. 29, 2018, by a federal grand jury. 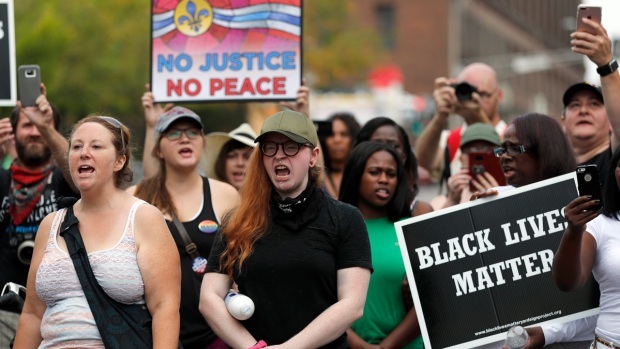 Three are accused of beating an undercover colleague during a protest over the acquittal of Stockley, a white officer who was accused in the death of a black suspect. Those three and a fourth officer are also accused of conspiring to cover up the crime. Three St. Louis police officers were indicted Thursday for allegedly beating an undercover colleague during a 2017 protest and, along with a fourth officer, conspiring to cover up the crime. The U.S. Department of Justice announced the indictments of officers Dustin Boone, Randy Hays, Christopher Myers and Bailey Colletta. All four are suspended without pay, the city said. The indictment follows an FBI investigation requested last year by St. Louis police. The September 2017 acquittal of former police officer Jason Stockley set off weeks of protests. Stockley, who is white, was found not guilty in the 2011 death of a black suspect, Anthony Lamar Smith. The indictment alleges that Boone, Hays and Myers beat the undercover officer during a protest on Sept. 17, 2017, and that the three along with Colletta conspired to cover it up. Demonstrators disrupted shopping at upscale suburban malls on Saturday and later marched through a popular district of bars and restaurants to protest a white St. Louis police officer's acquittal in the killing of a black man, but the second day of protests was peaceful following sporadic vandalism and violence a night earlier. "These are serious charges and the vigorous enforcement of civil rights is essential to maintaining public trust in law enforcement," U.S. Attorney Jeff Jensen said in a statement, adding that the St. Louis Metropolitan Police Department "recognized the importance of this investigation and its leadership has cooperated at every turn." St. Louis Police Officers Association business manager Jeff Roorda said all four officers are members of the association, but he declined further comment. Mayor Lyda Krewson said professionalism is expected of all officers, without exception. "The charges brought against these officers today do not reflect the standards we hold ourselves to as public servants," she said in a statement. Cori Bush, a protest organizer, said the indictment should send a message to police. "Now officers will start to see they may be accountable for their actions," Bush said. "So it's a start." Stockley had tried with his partner to corner Smith, 24, in December 2011 after observing what they thought was a drug transaction on a fast food parking lot. Smith drove away, nearly striking the officers. That led to a chase. Stockley shot Smith at the end of the chase. The officer claimed self-defense, but prosecutors alleged that Stockley planted the gun found inside Smith's car. Stockley left the police force in 2013. The acquittal immediately set off protests in the St. Louis region that was still recovering from unrest that followed the fatal police shooting of Michael Brown in nearby Ferguson in 2014. Perhaps the most violent of the Stockley protests occurred two nights after the acquittal when demonstrators broke windows and damaged property downtown. About 120 people were arrested during a police technique known as "kettling" in which officers form barriers that gradually close in on the protesters. U.S. Rep. William Lacy Clay, a St. Louis Democrat, and civil rights leaders demanded investigations, saying many of those arrested were peaceful protesters, onlookers and journalists. 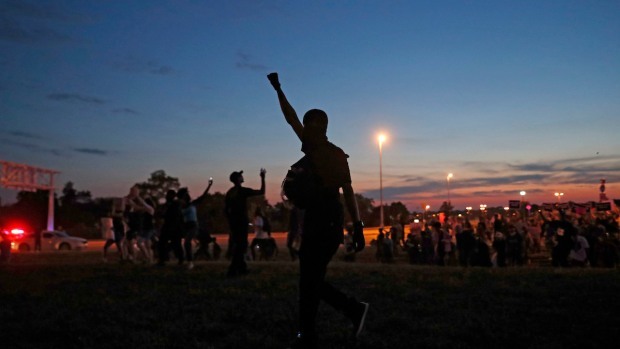 Protest leaders accused police of heavy-handed tactics and even taunting. The indictment said all four of the accused officers were part of the police department's Civil Disobedience Team, which included more than 200 officers responding to the protests. Police in St. Louis arrested more than 80 people and confiscated at least five weapons after violence broke out following peaceful protests, the police chief said Monday. "People setting out to do damage are being arrested, and these criminals we've arrested should be held accountable and prosecuted to the fullest extent of the law," said Acting Police Commissioner Lawrence O'Toole during a press conference early Monday morning. "We're in control, this is our city and we are going to protect it." The protests are in response to a recent not guilty verdict for an ex-police officer who was charged with first-degree murder. A 22-year police veteran identified only as L.H. also was part of the team, but working undercover, the indictment said. The indictment accused Boone, Hays and Myers of throwing L.H. to the ground, and kicking and striking the undercover officer, using a police baton. They didn't know at the time that the person was an undercover officer, according to the indictment. Boone, Hays and Myers conspired to obstruct justice by trying to prevent information about the attack from reaching federal authorities, the indictment said. Myers was accused of destroying L.H's cellphone as part of the obstruction. Colletta, whom the indictment said was involved in a romantic relationship with Hays, was accused of making misleading assertions and false statements in testimony before a grand jury. The indictment includes electronic messages shared between the officers. In one exchange on Sept. 17, 2017, Boone was asked if he was doing OK.
"Yeah. A lot of cops gettin hurt, but it's still a blast beating people that deserve it," he allegedly responded. Police actions during the Stockley protests are the subject of a lawsuit filed by the American Civil Liberties Union of Missouri. It alleges that officers shoved the heads of some of those arrested into the pavement and taunted protesters by chanting "Whose streets? Our streets!" mocking a common chant by demonstrators.